I was thinking about teaching the After the Bell kids who I work with about crocheting. Then I thought, well, let’s see if there’s an easier way to teach crochet to young kids that don’t have great hand-eye coordination. 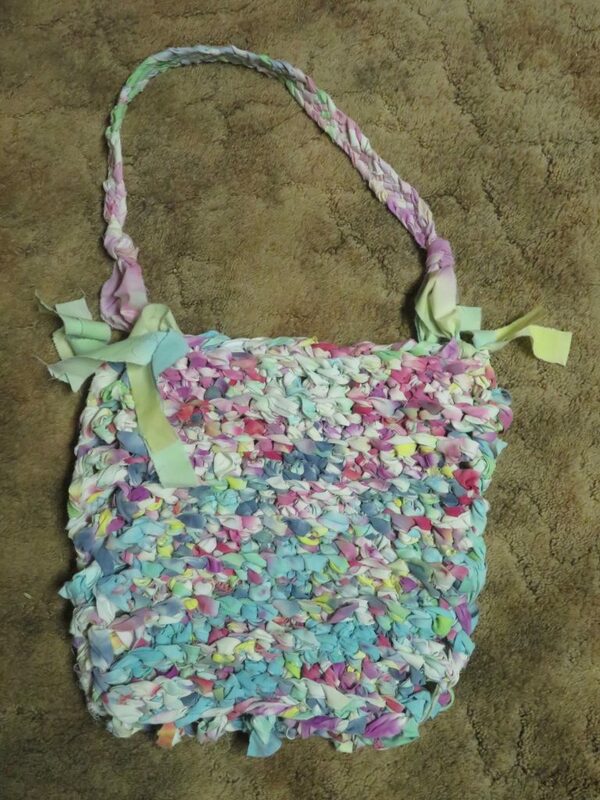 Right now, finger crochet using either plastic shopping bags or t-shirt material is pretty popular. I tried the plastic shopping bags… and I had trouble. So I kept thinking… material… material… what could I use for material? When this after school program started years ago, they tie dyed some white sheets to hang up in their open meeting building, just to cut down on the noise level. We still had those sheets stashed in a box. It’s not great… but it’s colorful! I doubt I will teach the kids this… just due to time constraints… but I was happy to have some success! That looks fun. I might have to figure it out. What a fun shopping bag! You are amazing. So talented.